I hate New Year's Resolutions and since they usually involve eating less or exercising more I thought it only appropriate for my non-resolution to involve eating more - or at least at some new places. Here are 12 spots in the Bay Area I've yet to try. Let me know what you think of these or hit my comments with other suggestions. Manresa, Zagat's new #3 in the SF Bay Area. I've been to Mina, Danko and French Laundry and Zagat's got it wrong by the way. Danko doesn't really fit in the same paragraph as French Laundry. Whoops ... i just did it myself. OK, Danko was good -- just different than French Laundry, as was Mina in San Francisco. A16, Sadly I'm in the Marina at least once a month and yet I've not been able to keep a reservation here. I've been to Pizza Antica, Zaccahry's and Tomasso's and I can't wait to see if A16 measures up. Pizzaiolo in Oakland, another budding Pizza & more joint that doesn't take reservations. Oakland's dining scene is coming along and I want to check it out. The Cheese Steak Shop, I've never been to Philly but rumor is this is just as good if not better. If they can top Jersey Joe's in Belmont I'll be impressed. Kirala in Berkeley, I can't expect their Sushi to top Sonny's but I can't wait to try it since 13 Yahoo! Local Reviewers all gave it 4+ Stars. Even Mikey likes it. Sushi Groove, one of Stoey's favorites. 'nuff said. What's up Dog?, I've been to Top Dog and Pink's but can this place really stand up to the West Coast's elite Hot Dog venues? We'll see. Burma Superstar another one of Stoey's favorites, and Carmen's and everyone that's reviewed it on Yahoo! Local. No reservations ... wait in line. Everett & Jones Barbecue, Gayot says "If you could have one last soul food dinner, you should choose E&J" - I'm game. COCO500, which is Bizou refactored. I liked Bizou the first time around quite a bit, so I can't wait to try Bizou 2.0. The last 2 are going to come from you, so hit my comments and tell me where in the Bay Area I should be eating. Dives, Fast Casual or Gourmet-Deluxe I'll give it a try. Buttermilk Bar + Peet's Coffee (bring your own) need I say more? Finally, they kicked us out for bringing our own coffee, so I'd like to thank Armadillo Willy's for providing us a place to enjoy Hot Donuts, Taco Bell for providing Pepsi for those who needed more caffeine and Quizno's who sold bottled water. This is one mini mall that had it all. Sometimes there's nothing better than fresh, hot donut not made by Krispy Kreme and Stan's delivers. They may not be #1 in customer service but their donuts are top notch and made by hand, so bring your own beverages and plan on taking them to go or sitting outside. 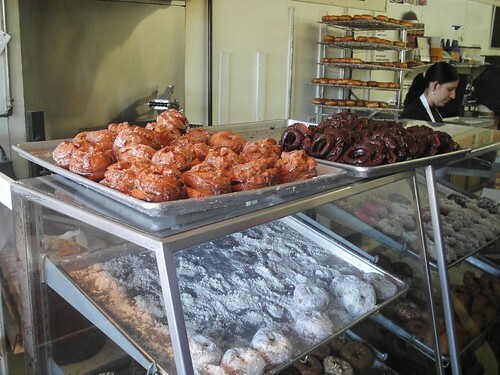 Where's your favorite Donut shop? hit my comments. I'm a huge fan of the movie Sideways so my first map captures the adventures of Jack & Mile's through the Santa Barbara Hills. What kind of map will you make? I must say I never really liked Bobby Flay all that much. 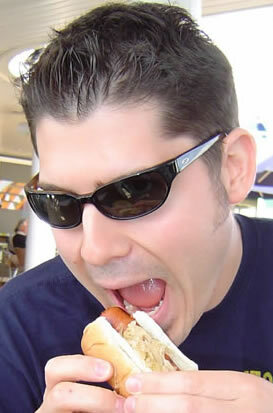 Not that I knew him personally, but way back when he got started he had a show on FoodTV where he'd grill with a hillbilly, let's call him Billy. Bobby would treat Billy like trailer trash on national TV and and Billy, being the southern gentlemen he appeared to be would just take Bobby's crap. Whether Bobby Flay could grill or not, he certainly came off like a real jerk. After seeing Bobby on Iron Chef America and watching his Vegas restaurant come to life on the Food Network I couldn't help but be impressed by what I saw. His culinary genius really seemed to come through in his recent work and I wanted to try everything I saw him prepare. A recent trip out to Vegas for a friend's bachelor party afforded me the very opportunity to see what Bobby Flay was up to. It's not all that often I get out to the desert and Bobby's other restaurants are way out in New York. The restaurants atmosphere left nothing to chance, it was bold and dazzling from the get-go. The charming, futuristically-retro interior sported multi-colored stained glass "walls" facing the Caesar's sports book, a small bar and 4 or 5 small areas of dining tables surronding the giant copper rotisserie where Bobby brings so many of his creative entrees to life. The staff was attentive and knowledgable without being doting. When it came time to choose a beverage, not only did they agree with my wine choice but they assured me it would be wonderful with my entree -- and they were right. So enough, let's eat. At first glance the menu doesn't seem all that lengthy, in fact you don't realize how daunting your choices are until you find that you want to order everything. I bought us some time with a quesadilla: Smoked Chicken + Black Bean with Avocado + Toasted Garlic Crème Fraiche and some Southwestern Fries. These 2 items we're a smash, even though the quesadilla was tough to split between 5 we really enjoyed it. The fries were fine, but if I want fried food I'll go elsewhere. I apologize for the Camera Phone pix, they don't do the presentation or food justice. The pork was spectacular. The loin were cut into small rounds, cooked medium-rare and tender to the fork. Smoky, grilled, sweet, spicy, BBQey, buttery, succulent and almost chocolatey are adjectives that come to mind. I went with a spicy Sonoma Zinfandel to go with the pork which was (luckily) right-on. The Zin stood up to the spice like a champ. It goes to show, when in doubt, go with a good Zin. Don't skip the corn husk! The sweet potato tamale is perfect, rich corn embodies sweet potato and the occasional pecan crunch. Buttery sweet and blissful, you don't want to miss this tamale. I for one cannot wait to have this dish again, in fact I think I'll have to see if Bobby will give me the recipe. The tuna was really good -- and I'm glad since I think I convinced a few folks it would be. The rich, buttery tuna steak comes alive beneath the Apricot-Mustard-Mint Glaze and the flavorful Couscous offered a welcome departure from the fish's rich texture. This was Tuna done right (and even rivals my favorite Sashimi at Sonny's). We didn't want to do it. We already overdid it the night before at Emeril's. We shouldn't have done it. We ordered dessert. Hey, we needed to have a little something with our coffee and Bobby was already batting a thousand, so why not? Why not is because the night before they had to roll us out of Emeril's Steak House after bread and potatoes and wine and ribeye steaks and crazy desserts with coconut chocolate and cream. Ugggggh. So, we only got one dessert. One bite each we said. We arm wrestled for quite a while with the decision but concluded on a peach cobbler of sorts. Peach pound-cake croutons, small scoops of peach ice-cream and a few blackberries all drizzled in warm caramel sauce. Sure, it sounds good but I didn't expect it to taste like peaches. Was I wrong, the ice cream must have been made fresh - outstanding. The pound cake croutons were rich and fruity, like a perfect peach without the pit. 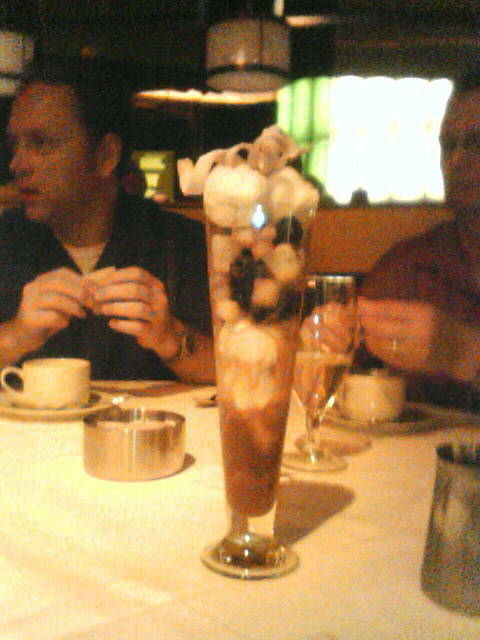 With a warm caramel sunset drowning the tall goblet of greatness, this dessert reminded me of summer and tasted no less sweet. What's left to say? Mesa Grill exceeded my already inflated expectations. The food was great and we enjoyed chatting with the staff about their menu, Wine and Local events. Given its Las Vegas location where even Big Macs cost more, the prices were fair and the portions large enough to satisfy. 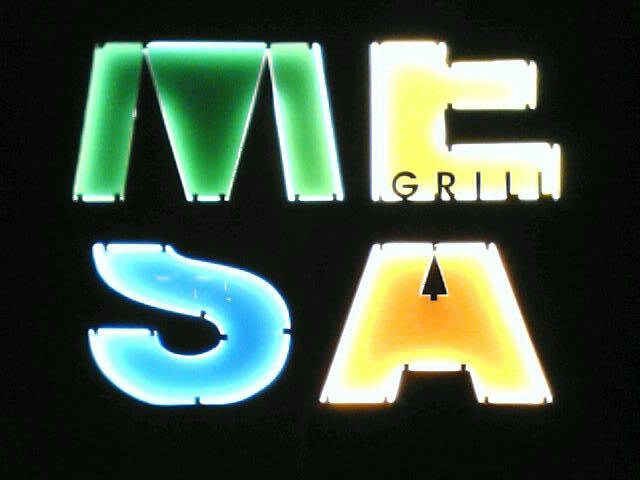 I don't know when I'll be back to Sin City but when I am you can be sure the first reservation I'll make is Mesa Grill. Did somebody say Vegas? Last Saturday night will go down in history, or at least my own memory, as a great meal. 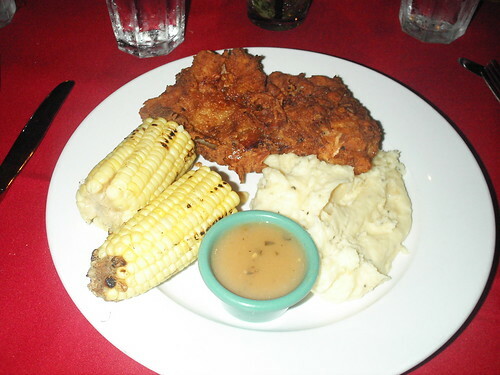 This was the first time I was lucky enough to try a restaurant often referred to as "Mina." You know the place. We had waited months to get in as Chef Michael Mina's restaurant in San Francisco, CA (near Union Square), as his staff had been plagued by a hotel strike in the preceding months. But this is the restaurant I had heard so very much about, often breathed in sentences along side French Laundry, Gary Danko and other wonders of creation. It was worth waiting for, and we're just glad we got in when we did. The evening started by being seated promptly, just before our reservation time. Service was impeccable to start, not that I really noticed as I drooled over the 2000+ bottle wine list, but we were pleased with our table and the level of attention from the staff. Let's cut to the substance here, the menu. Michael Mina offers you 3 options: The standard menu consists of 3 courses each prepared in 3 unique ways -- that's right, it appears you dine on 3 small portions per course (the exception here maybe dessert). He also offer 2 7-course options, a Seasonal and Chef's Tasting menu. We all opted for the Chef's Tasting menu, one vegetarian and the rest of us had some minor substitutions. Here's what we ate and what I thought of each dish. We also took a few pictures along the way, but the camera just wasn't behaving all that well in low-light. A wonderful terrine with Caviar, house-cured Salmon, cooked egg and chives mixed with creme freche. This should really be course 0, because it wasn't on the menu. This was outstanding. Not unlike Keller's Salmon tartar ice-cream cones with creme fresche, the first thing I was served absolutely knocked my socks off. This was a tuna tartar with Quail egg, pine nuts, sesame oil and a hint of pear. IN keeping with fine French service, the server explained each dish that brought to the table and then did any final prep. In this case the egg was blended into the tartar right on our plates. I wasn't crazy about watching them do this, but this dish really tasted great. There's something so right about raw fish and egg yolk mixed with the subtle crunch of pine nuts that really hits the spot. It just doesn't get any better than this. Rich blue cheese, baked into a souffle and then blended with more blue cheese and pear melted to perfection. I lack the vocabulary to explain just how very much I enjoyed this dish. The requisite foie gras course. I knew it was coming, I'd been looking forward to it since I ordered that Joel Gott Zinfandel from Amador County. In this case we were each served 2 portions, 1 seared and 1 not. Pineapple and ginger accompanied each and a small wedge of toast adorned the middle of the dish. I really enjoy the complexity the seared foie gras brought to this course, but as another diner pointed out, the "simple" foie gras really hit the spot with a wonderful texture and alluring mouth-feel. This was a very good dish. Next we were treated to the miso-glazed sea-bass w/ scallop wonton. The sea-bass was done perfectly and the delicate balance of flavors made us wonder if the recipe had snuck it's way over from Pisces or Aqua. I steered clear of the wonton due to allergies, but others seemed to enjoy it. This fish was truly succulent. 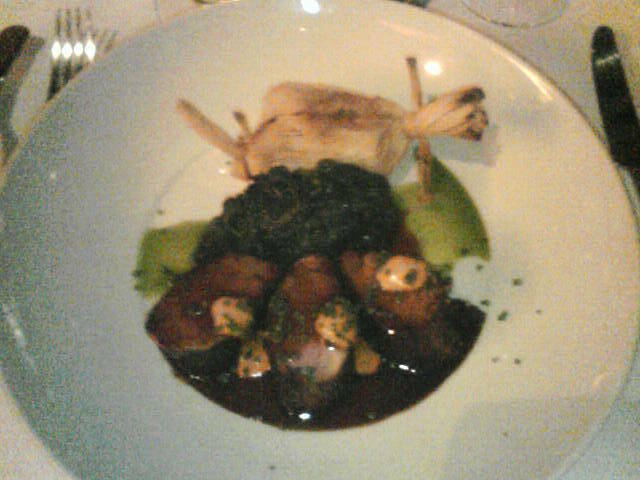 This course marked my first time having Poussin. Poussin is a very tender chicken, similar to the French spring chicken, with a very refined flavor and light colored meat throughout. As you can see above, we had a small portion of the chicken which was served with truffle Mac & cheese and a small bowl of steamed vegetables. I liked this dish, the Mac & Cheese was creamy and decadent and the vegetables lightened the dish up nicely. I think I'll need some more practice though, that is before I'm eating "the veal of chicken" on a regular basis. Here comes the beef. That's Kobe beef (filet cut?) served with seared foie gras and a potato asiago gratin. I can't say I wasn't looking forward to this. It's not all that often I get have Kobe beef. 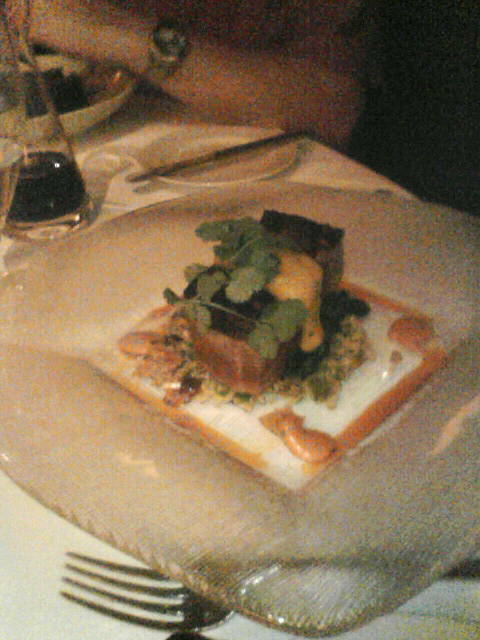 The beef was tender and made a wonderfully complex pair with the foie gras. If you look closely you can even see that the potato gratin is made up of a dozen-plus thin layers of potato. I loved this dish, everything about it was right. Let's get started w/ Dessert, shall we? The boys got the key lime pie and the girls went with the chocolate dessert. At this point I can barely hold the camera straight, I just want to sink my teeth into that pie. The key lime pie was beautifully finished with a meringue topping and served along side it, a mascarpone sorbet w/ kaffir lime syrup. The pie was very well done, but the sorbet -- with it's too-cool-for-school miniature lime-section buried beneath the mascarpone -- really took the cake. Sweet, creamy and refreshing all at once. Above is the molten chocolate-cake with peanut butter center served with a Peanut Butter milkshake. The cake reminded me of a rich chocolate souffle with a peanut-butter surprise inside. The shake was creamy and rich with fresh-roasted peanut flavor. Again, another great dessert from Mina. Another bonus course! I had heard about these. These were Mina's signature way to finish a meal. Each guest was served one each of 2 bon-bons. The first, a malted ice cream covered in milk chocolate followed by its companion, a Dark Chocolate bon bon with Mexican chocolate ice cream. Both were served atop crumbled butter toffee bits for rolling. Mina again takes the mundane and makes it great -- chocolate bon-bons creatively executed, nothing like you'd see over at Baskin Robbins or the DQ. This was dessert. In closing, the coffee we had with dessert was a dark roast served piping hot. My only complaint about the service was here, when I only received one cup. Perhaps this was a simple oversight on their part or just a sign that it was time to go. Or, perhaps we had overstayed our welcome, having been seated now 3 hours on our culinary journey. Whichever the case, I can't wait to see what Michael Mina has in store for me next time around. These aren't your mama's snack cakes, these are Fresh Hostess Chocodiles, yeah!